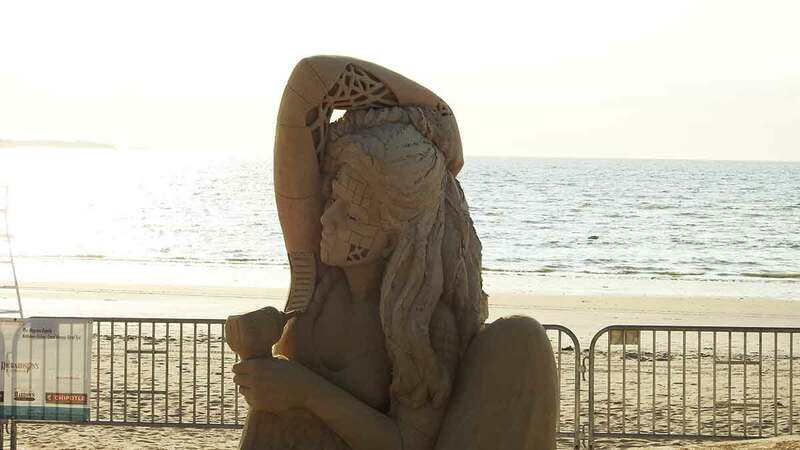 What a whirlwind. 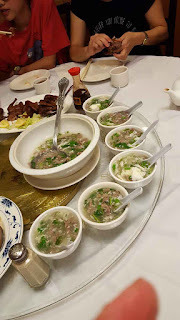 We had family over for three weeks. My first cousins once removed, whom I call my niece stayed with us longer while she did an internship at a local university. 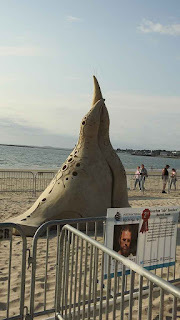 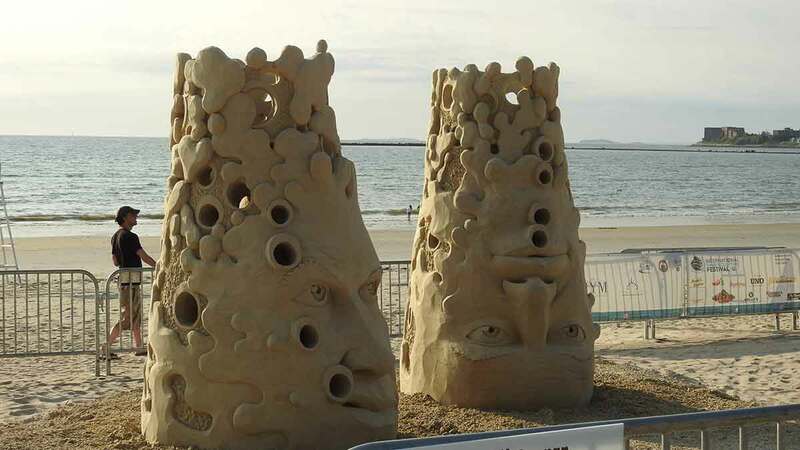 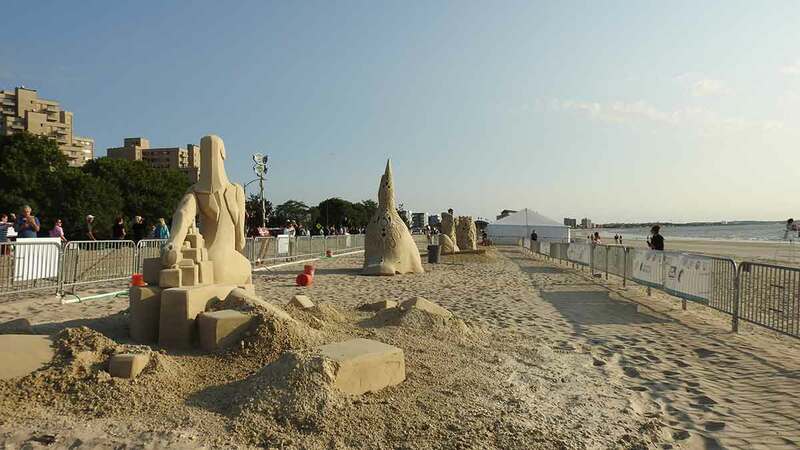 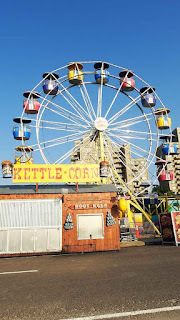 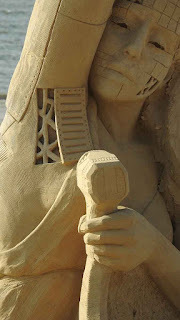 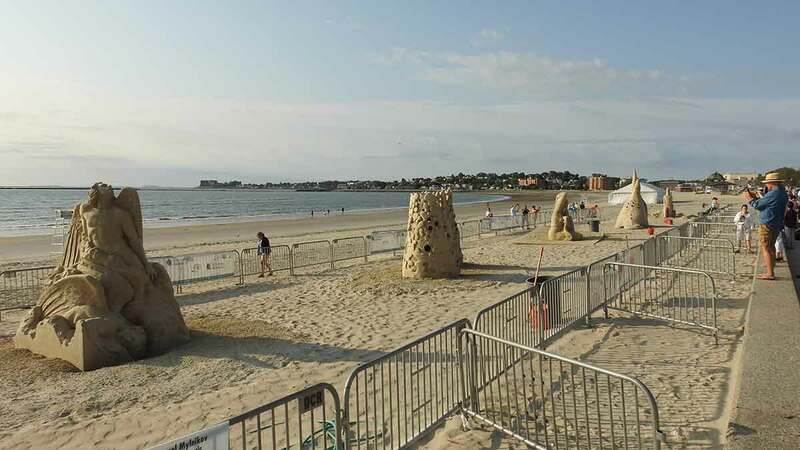 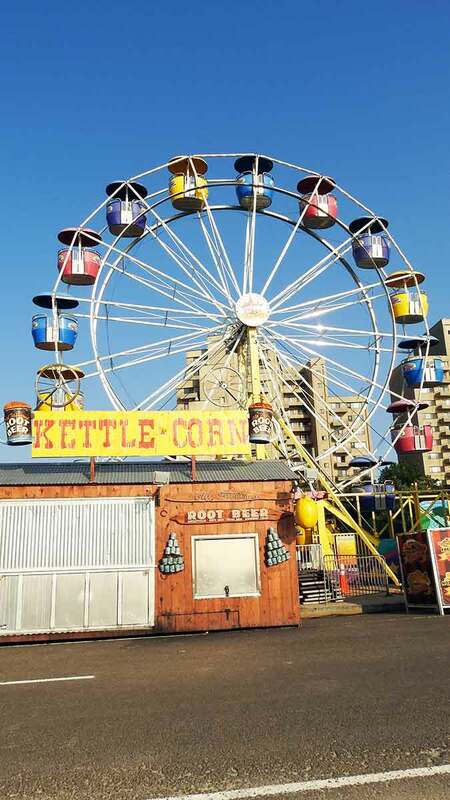 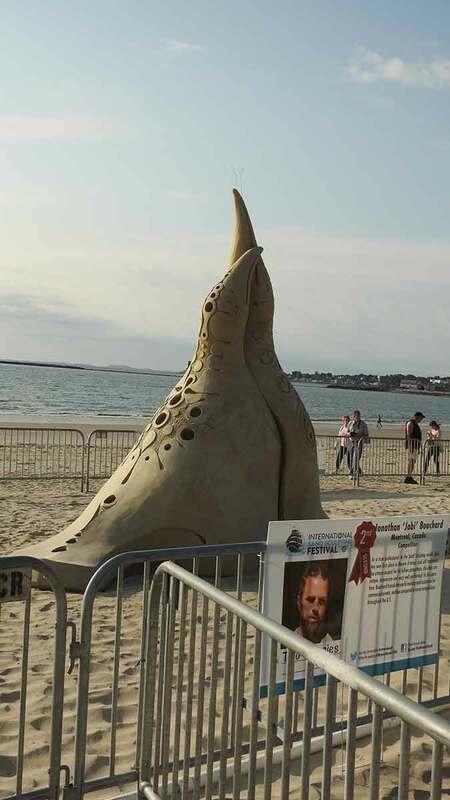 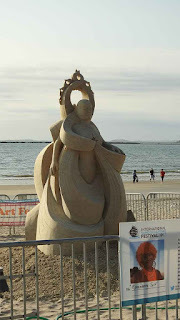 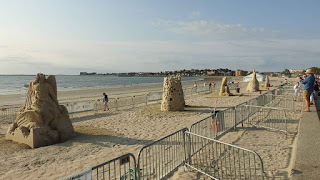 On July 23rd we went to see the Revere Beach International Sand Sculpting Festival. We arrived at 7:00 am before the sun got really hot. 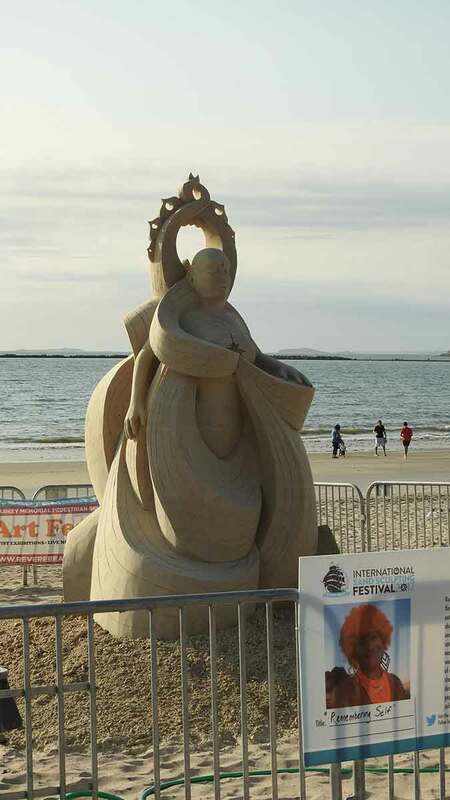 I still can't get my head wrapped around how they do such beautiful art with sand. Somewhere in the past month we also started painting our house. 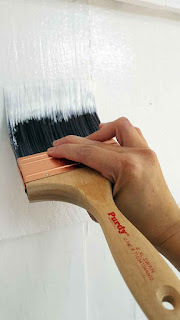 We didn't get far - I painted about 10 feet by 8 feet. 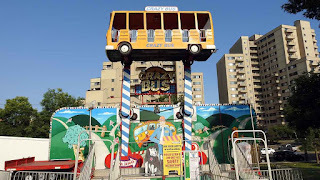 We still have the fall to do the bad section of it. 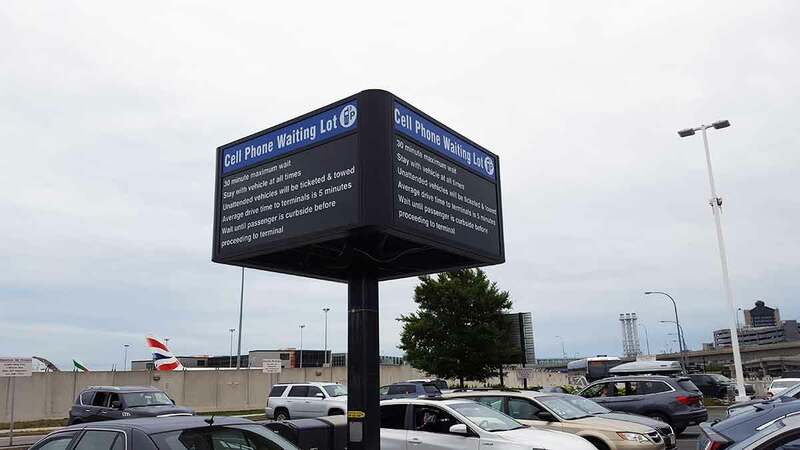 In addition, all summer we took approximately 10 trips to Logan airport. 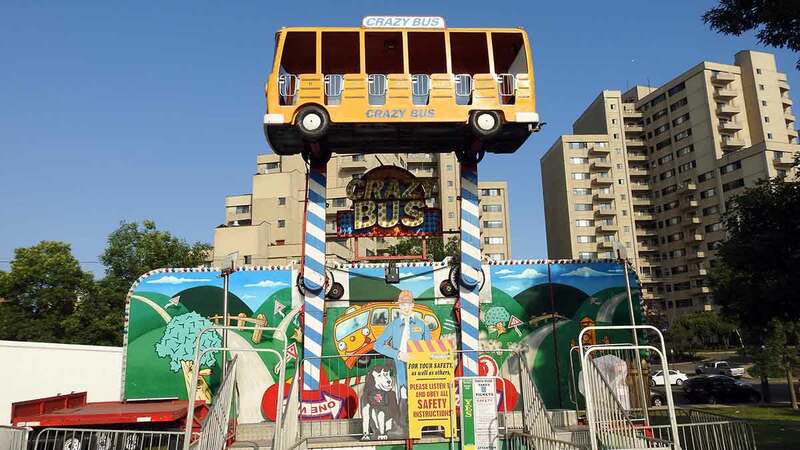 Picking people up and dropping people off. Yes, I am very familiar with the airport. 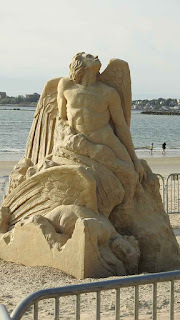 Our first cousin once removed asked hubby and I if we had another job with taking people to the airport. 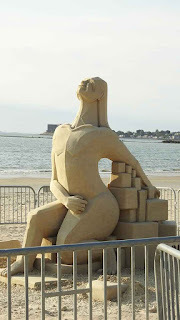 We do it for friends and family because we understand how hard it is to deal with lugging kids around, luggages, traffic, car seats, mass pike construction, delays, public transportation, uber. 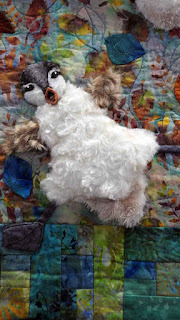 Hubby and I rarely travel - so what that means is we have accumulated many favors from friends for trips to the airport. We also went to a lot of restaurants while my cousin and her family were in town. 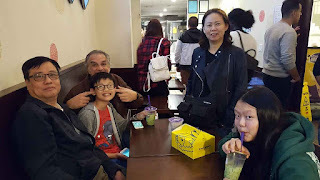 Here they are at a bubble tea shop in Chinatown after a full meal of Chinese food. 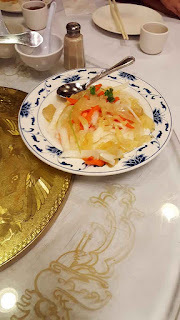 Yes, that's the cold jelly fish dish that I love. 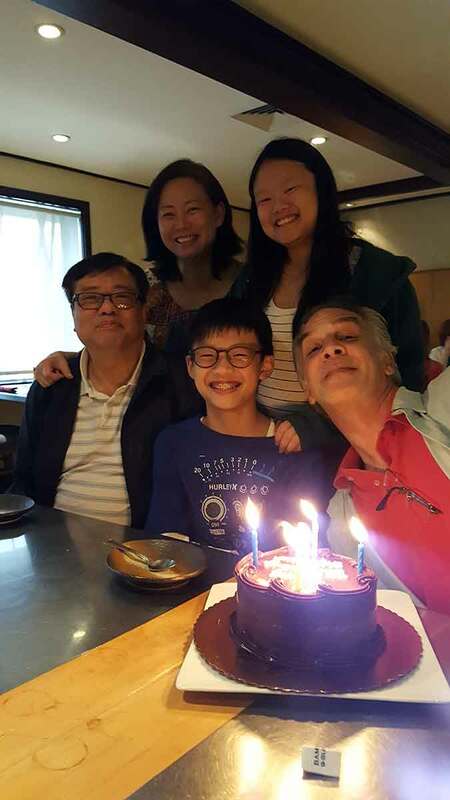 Matthew also celebrated his 13th birthday with us. We went to our favorite Japanese restaurant, Oga's in Natick. After they left, I literally vegged out for a whole week. They were fun to have around but boy, did I need to decompress. 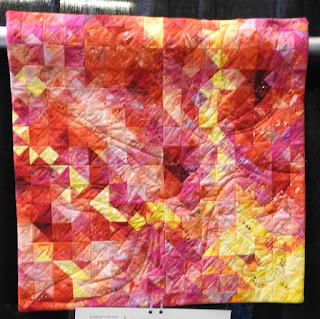 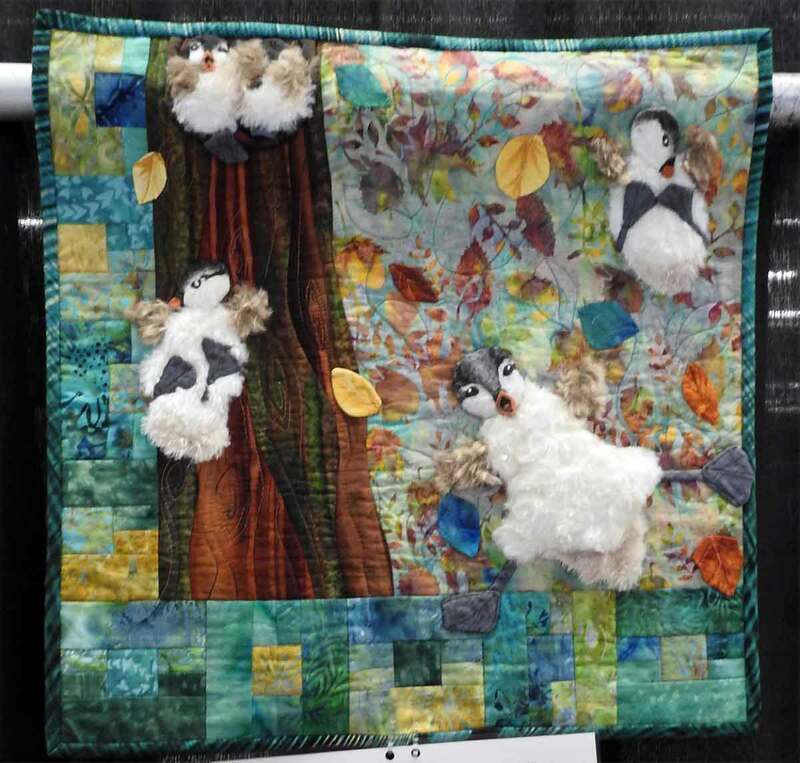 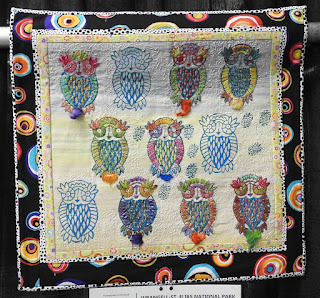 After 5 days of decompressing - I went to the Mancuso World Quilt show. 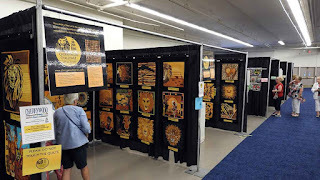 It was a wonderful show. 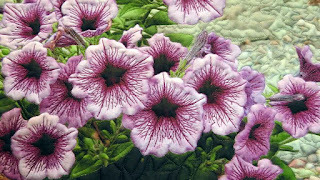 It encompasses everything. 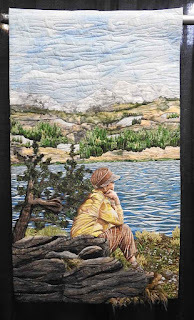 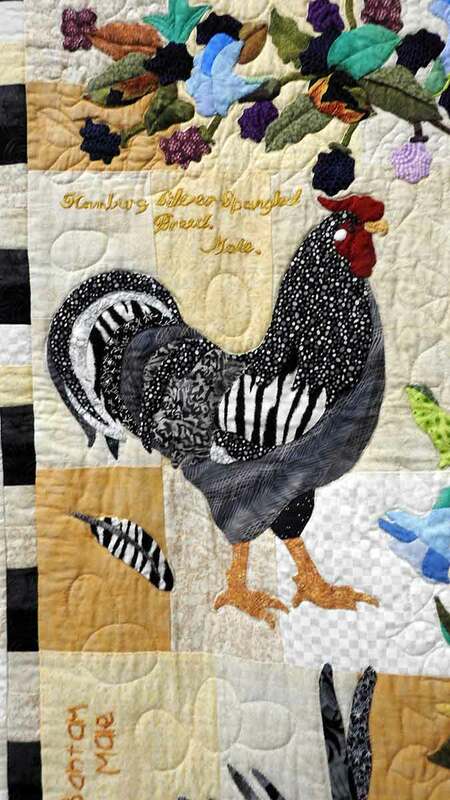 Traditional, modern, art quilts, everything! 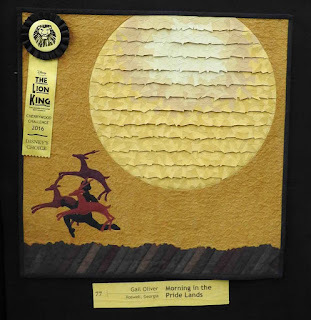 What was impressive was "The Cherrywood Challenge 2016 Lion King". 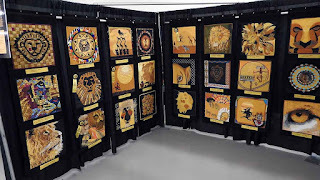 It was a challenge where each participant received 2 colors, gold and black and were told to make a quilt. 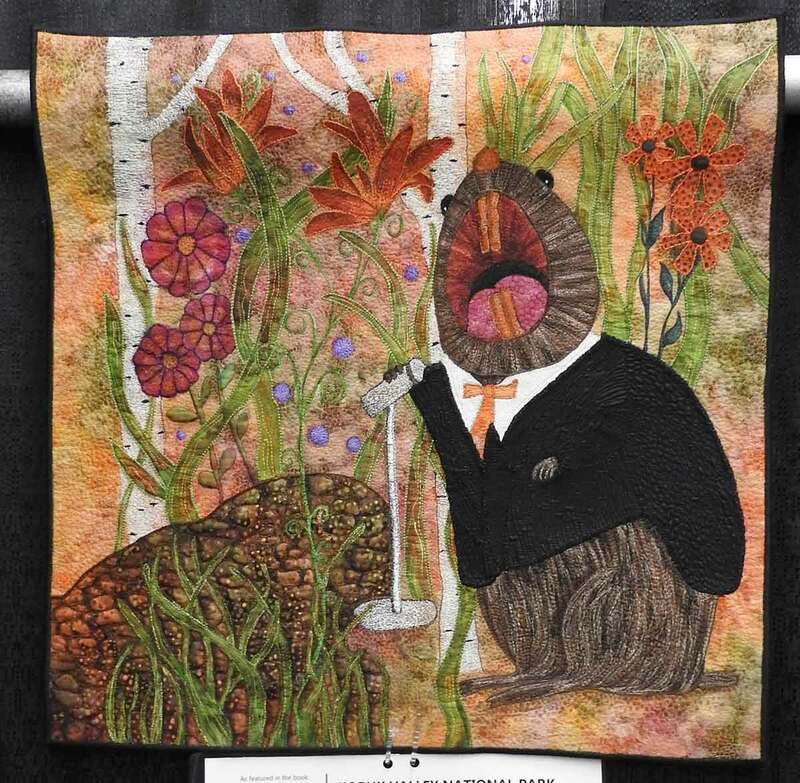 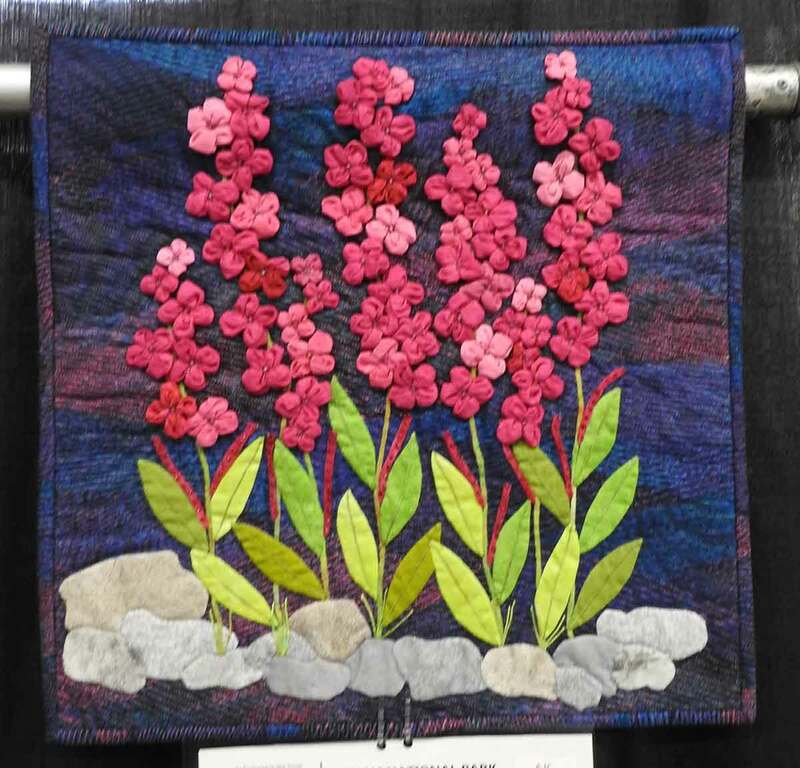 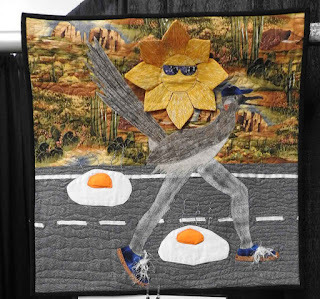 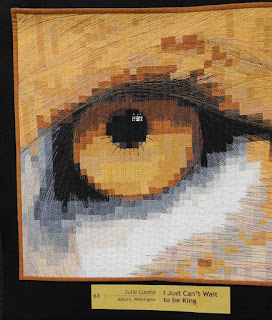 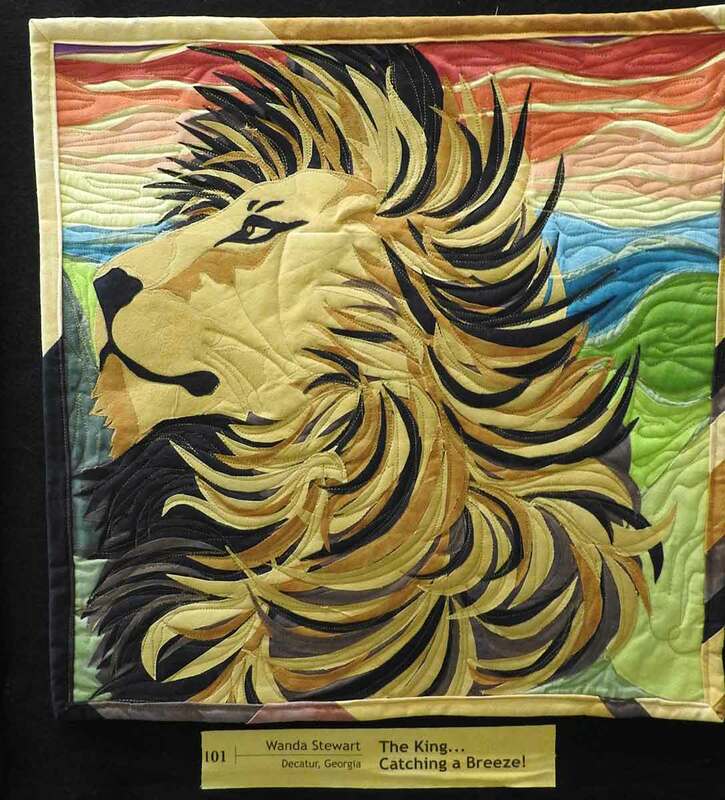 There were 304 entrants and on display were 138 quilts. 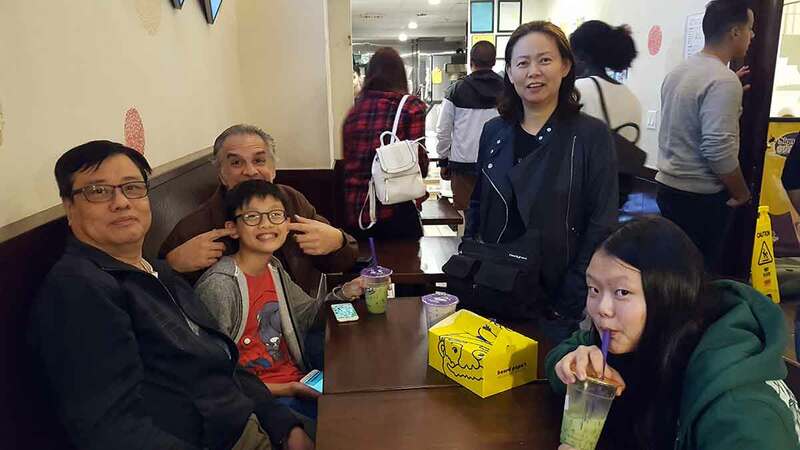 They are all so unbelievable. 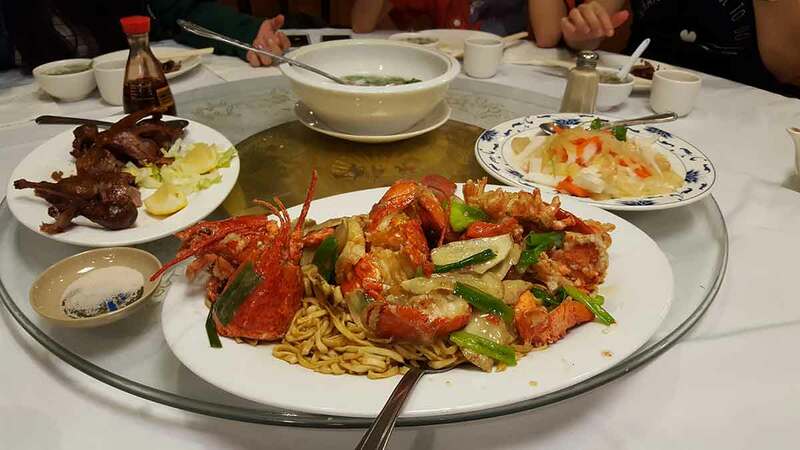 This is one successful challenge. 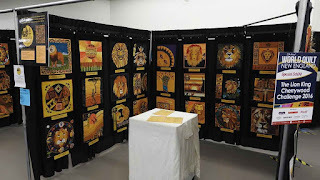 Even the way the show hung the quilts was incredible. There is another Cherrywood Challenge for 2017 which is "Vincent Van Gogh". 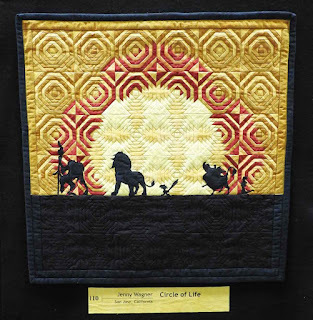 The deadline has just passed, August 1, 2017. 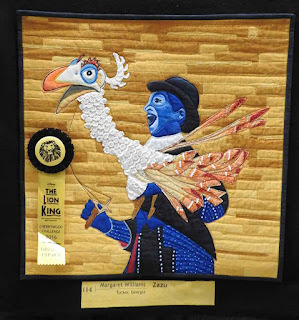 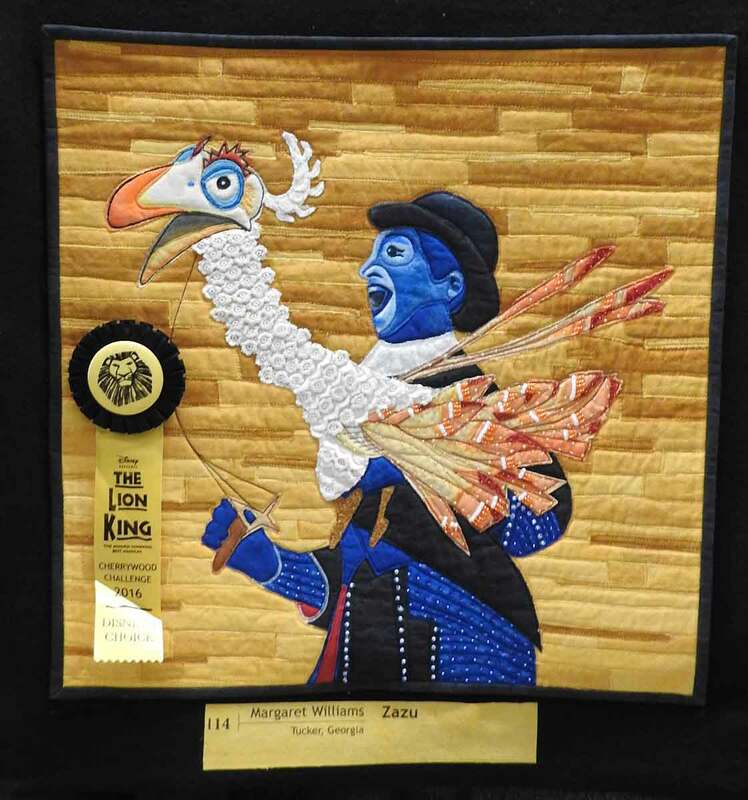 Margaret Williams, Tucker, GA, "Zazu"
Jenny Wagner, San Jose, CA, "Circle of Life"
Danielle Stimpson, St. Anthony, ID, "The Lioness' Prince"
Wanda Stewart, Decatur, GA, "The King.. Catching a Breeze!" 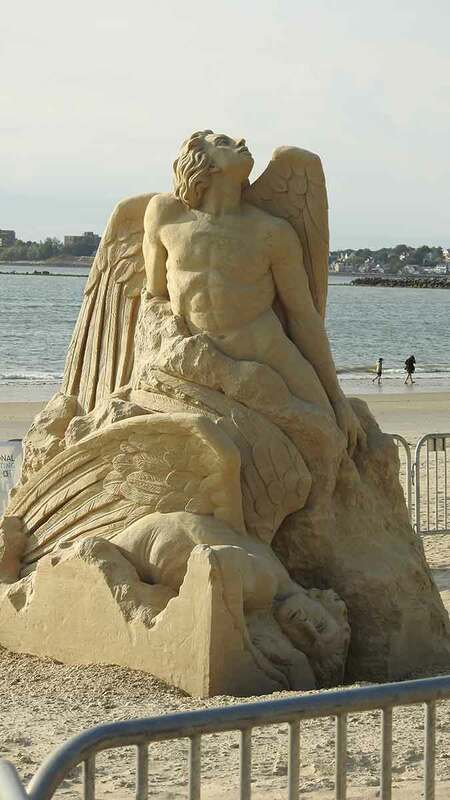 The one below is awesome. I don't know how she did it, but it is incredible. 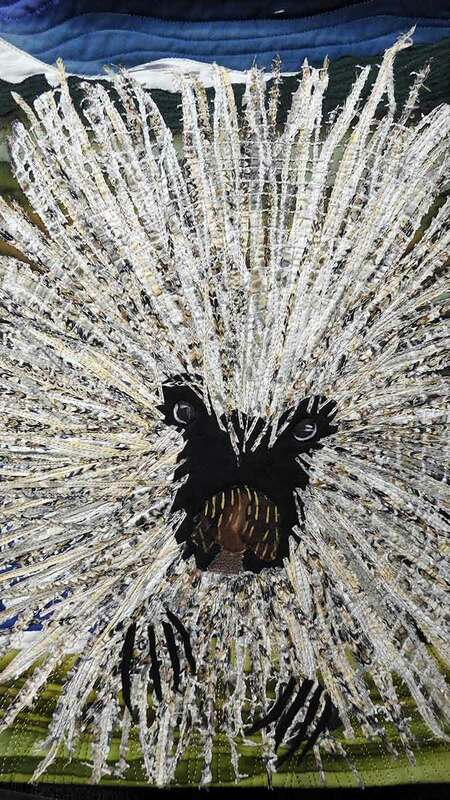 Look closely at the center black figure. 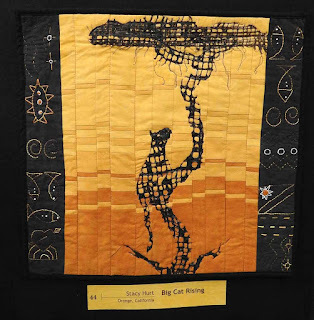 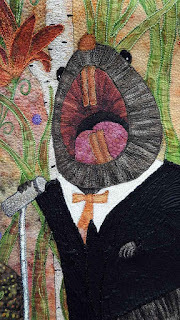 Stacy Hurt, Orange, CA, "Big Cat Rising"
When I first saw this, I was drawn to this beautiful quilt. I think the purple and how it is offset, drew me in. Lesly-Claire Greenberg, Fairfax, VA, "Prince and the King"
Rhonda Denney, Canon City, CO, "Pride"
This one is an interesting technique. 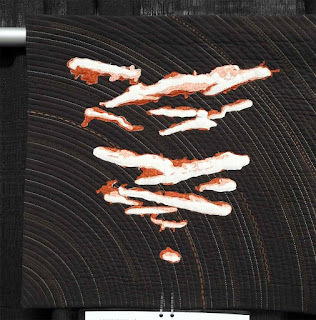 I don't know how it's done, but this is one technique that I would love to learn. 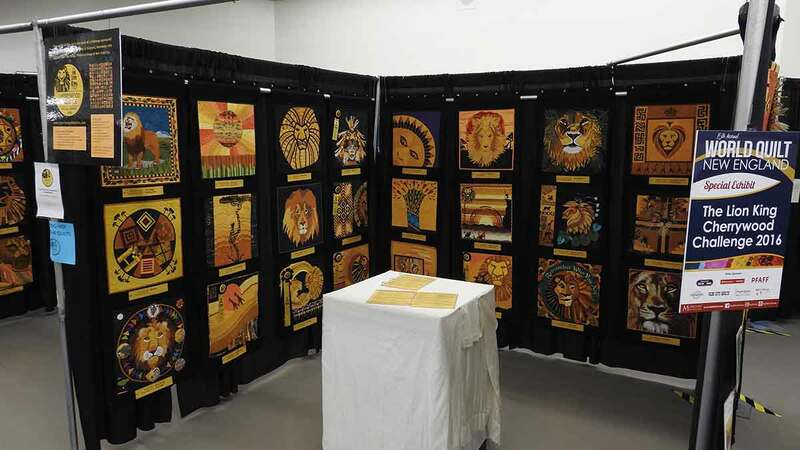 Heidi Proffetty, Bridgewater, MA, "The Calm Before the Roar"
Julie Luoma, Auburn, WA, " I Just Can't Wait to be King"
Carol Kolf, Sheridan, WY, "Shinda"
As I said at the beginning, the attention to detail including the hanging and the displaying of these quilts make it a successful display. 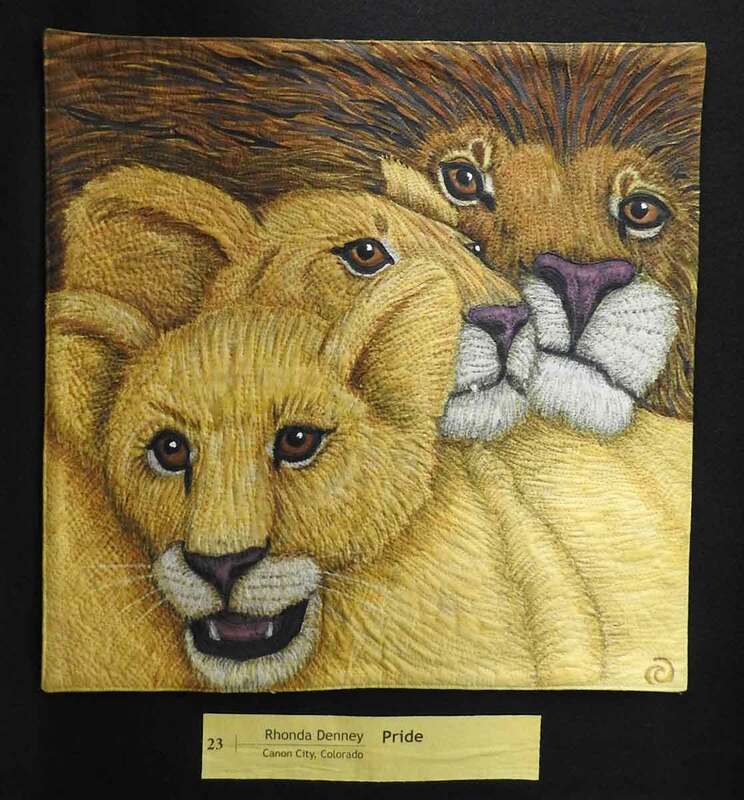 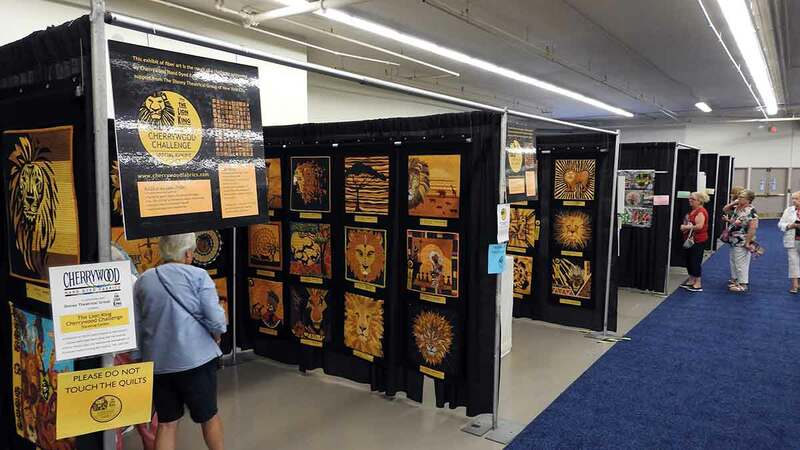 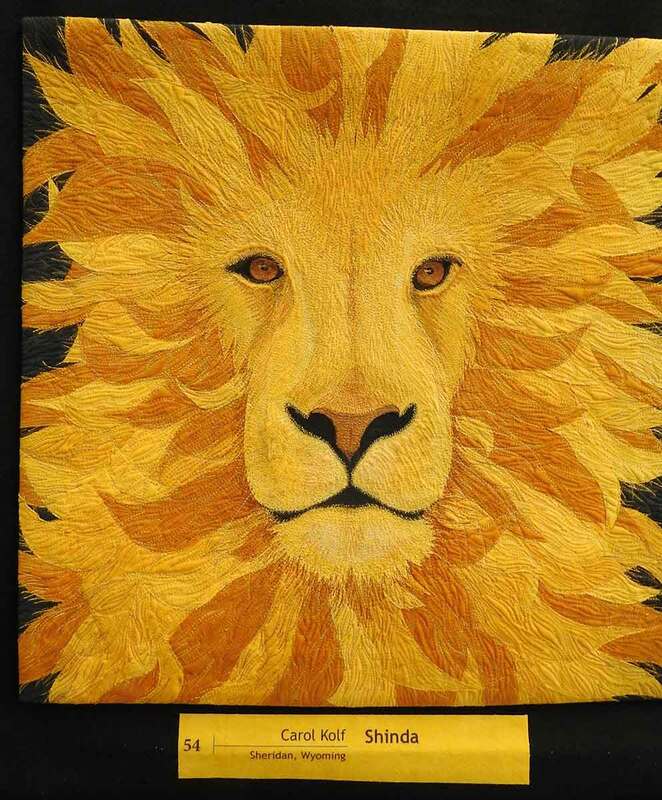 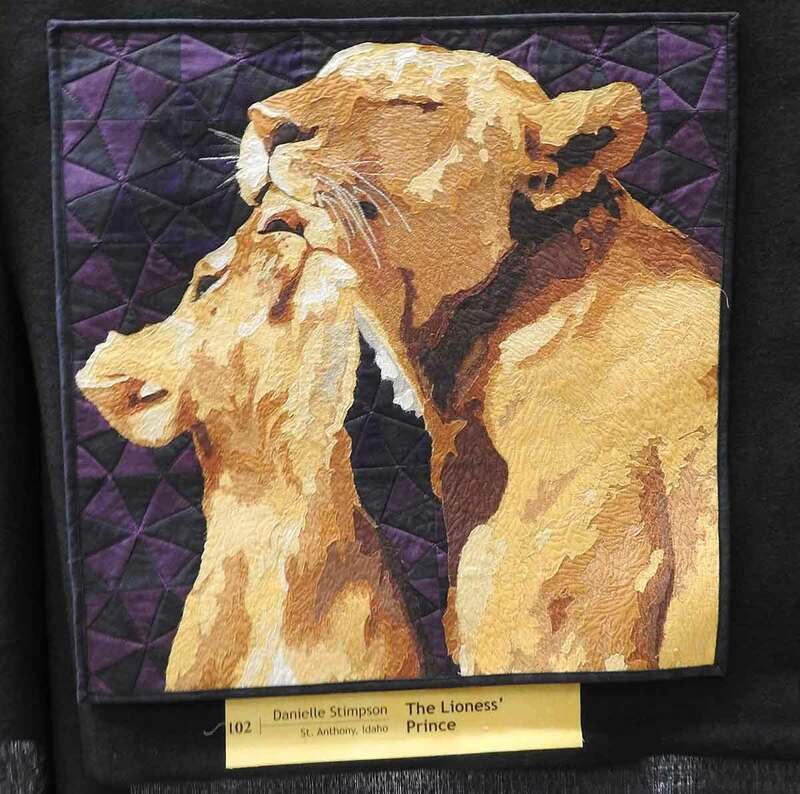 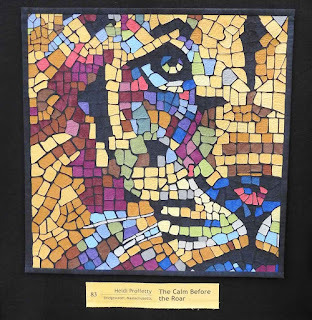 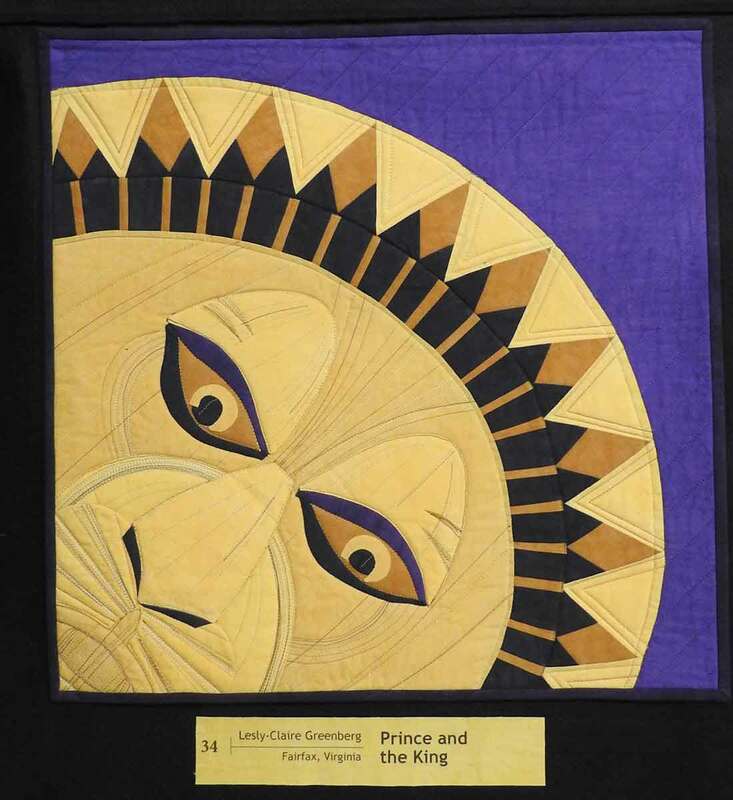 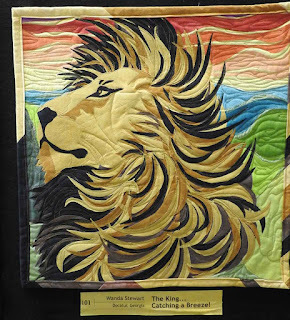 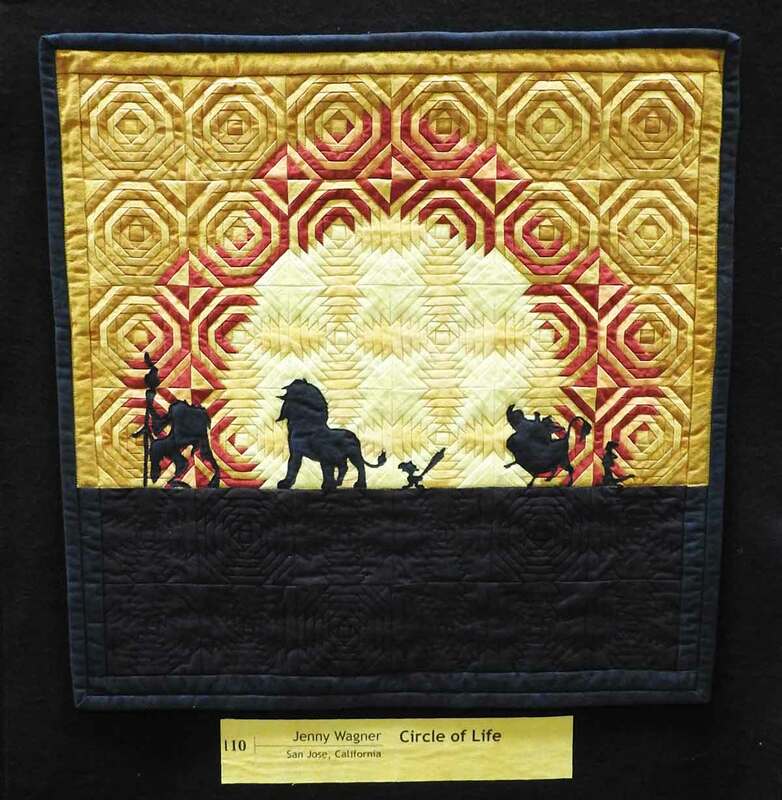 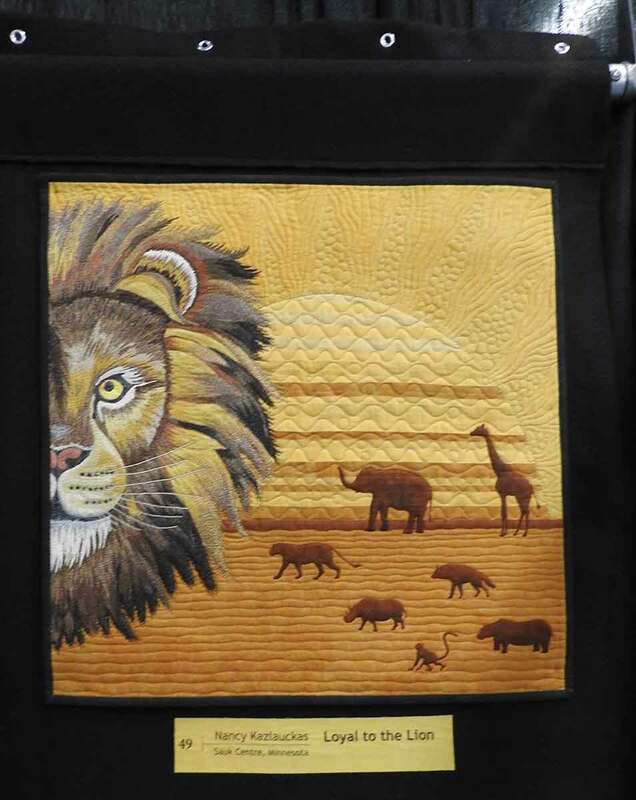 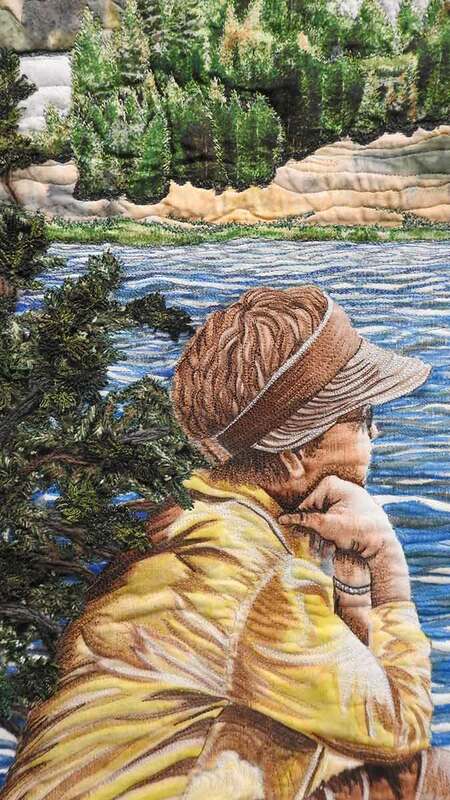 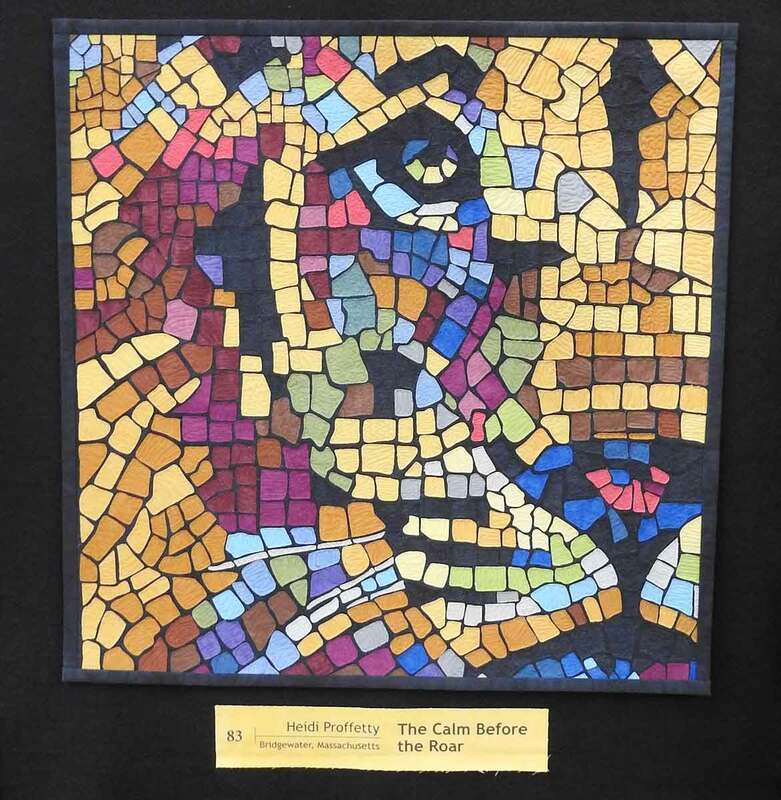 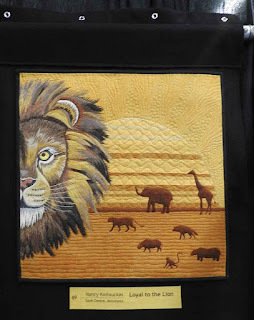 Nancy Kazlauckas, Sauk Centre, MI, "Loyal to the Lion"
Gail Oliver, Roswell, GA, " Morning in the Pride Lands"
Detail of "Morning in the Pride Lands"
Below is an exhibit of "Pennsylvania National Quilt Extravaganza presents One Woman Show - Quilts by Barbara Barrick McKie". 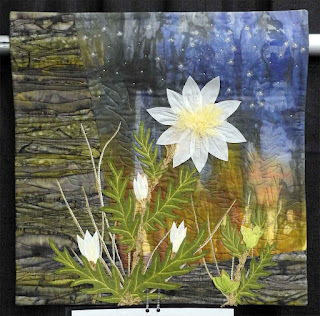 You can see more of her work on her website. 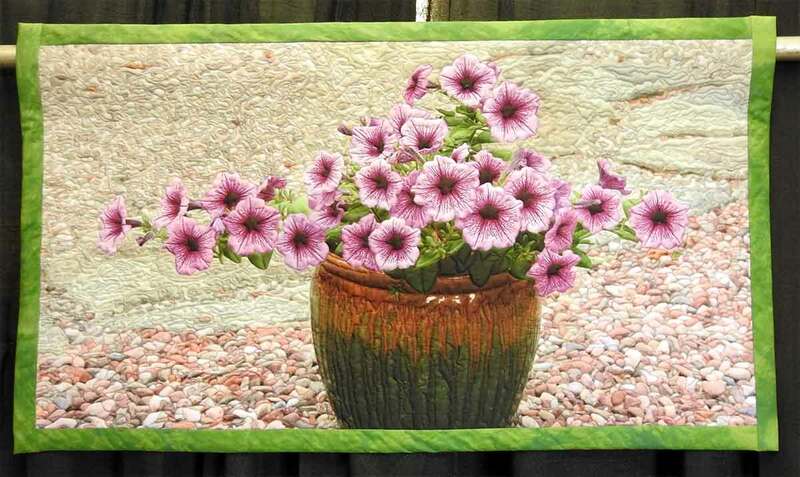 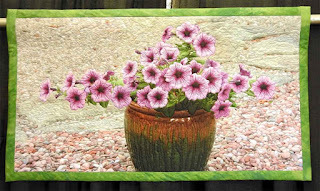 Barbara Barrick McKie, "Petunias on Parade"
"One year I found these beautiful petunias and planted them in a flower pot and put it in my rock garden. 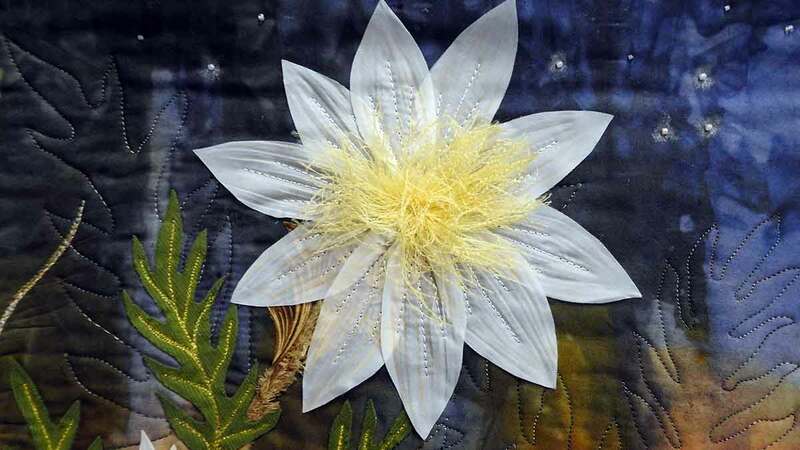 I particularly fell in love with the detailed dark veins in the flower, so I photogrpahed it in the garden and transferred the image to polyester crepe, layered it with 2 layers of wool batting, applilqued and free-motion quilted it with a home machine. 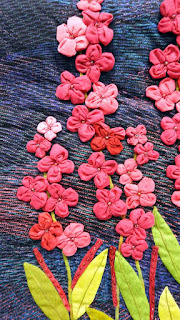 The border is my own hand dyed cotton." 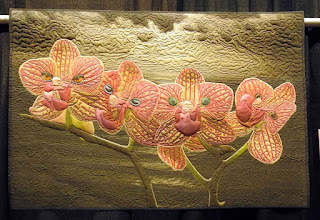 Detail of "Petunias on Parade"
Barbara Barrick McKie, "Moodlight Serenade"
"The Phalaenopsis orchids I got on Mother's day inspired the fifth quilt in my whimsical Plantimal series which combine flowers with eyes of animals. 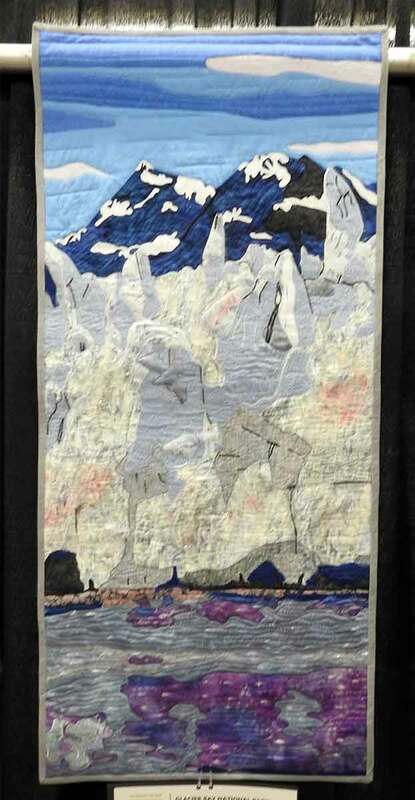 My landscape photo of the sea with the moon behind the clouds provides the background. Ink jet print on polyester crepe, 2 layers of wool batting, hand dyed cotton border, free-motion machine quilted and appliqued." 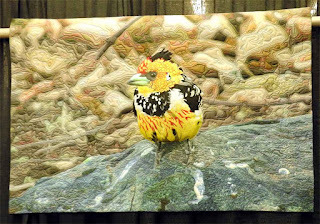 Barbara Barrick McKie, "Brested Barbet"
"One of the most beautiful birds I've seen, a Crested Barbet visited our lunch at our camp in Bostwana and I photographed it. 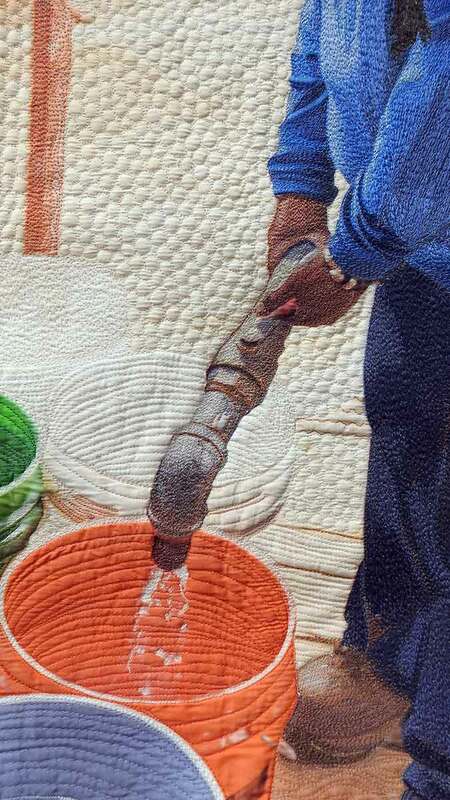 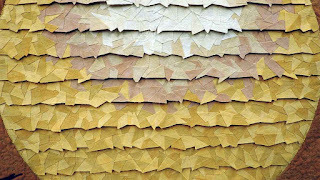 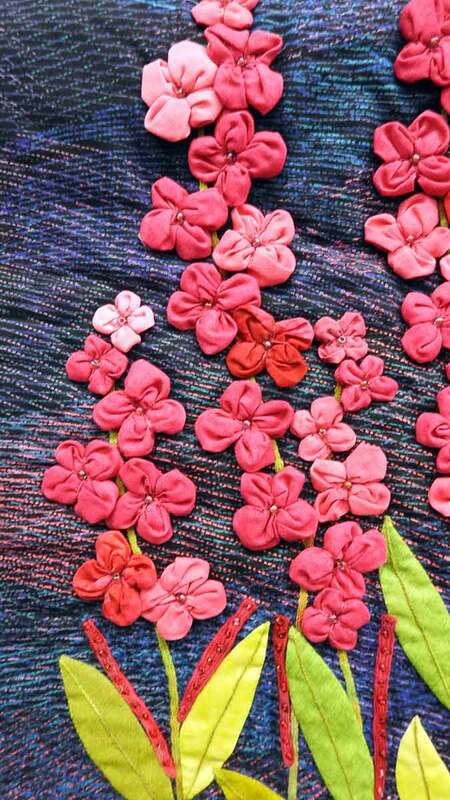 Disperse dyed digital polyester print, free-motion thread painted, machine appliqued and quilted, trapunto." Barbara Barrick McKie, "Desert Entertainer"
"While my husband hiked to the horseshoe bend of the Colorado River, taking my camera, I watched this White-Tailed Antelope Squirrel pose and dance. 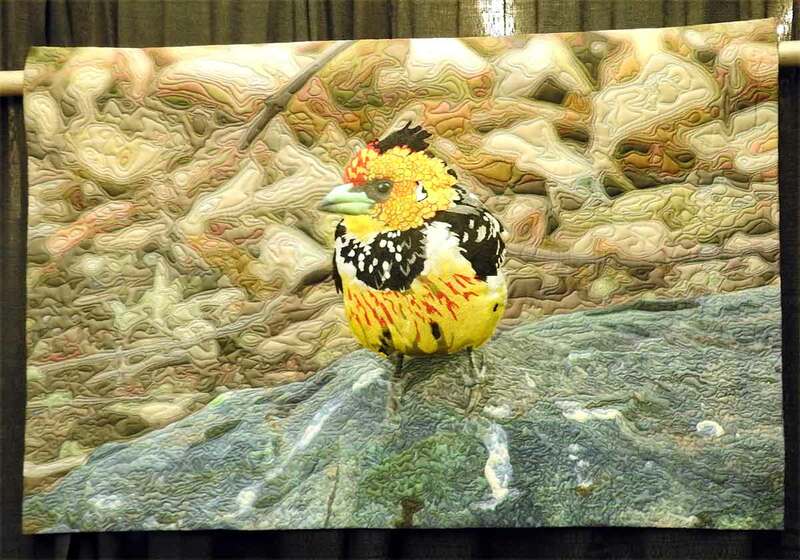 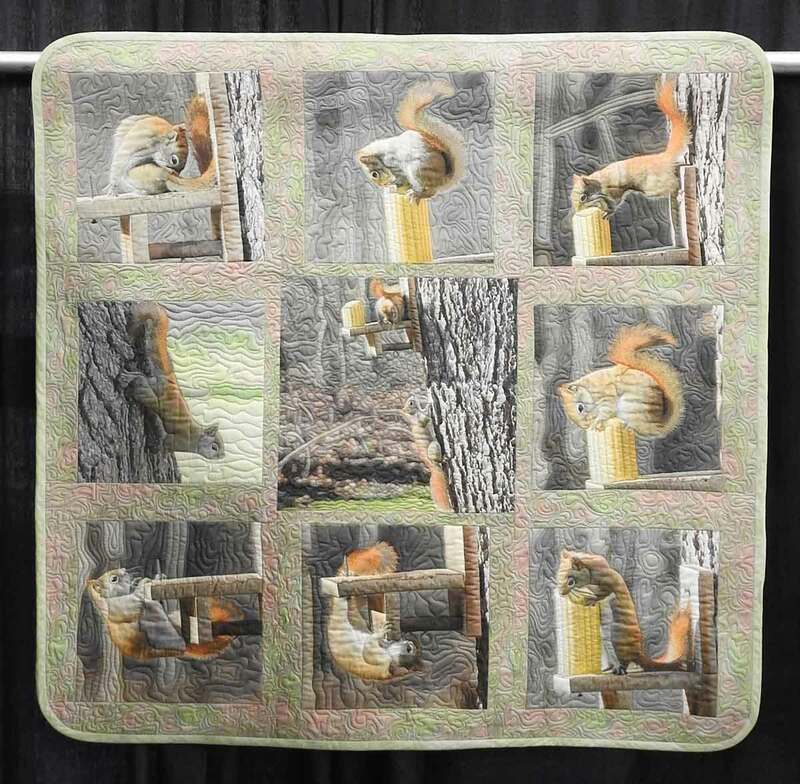 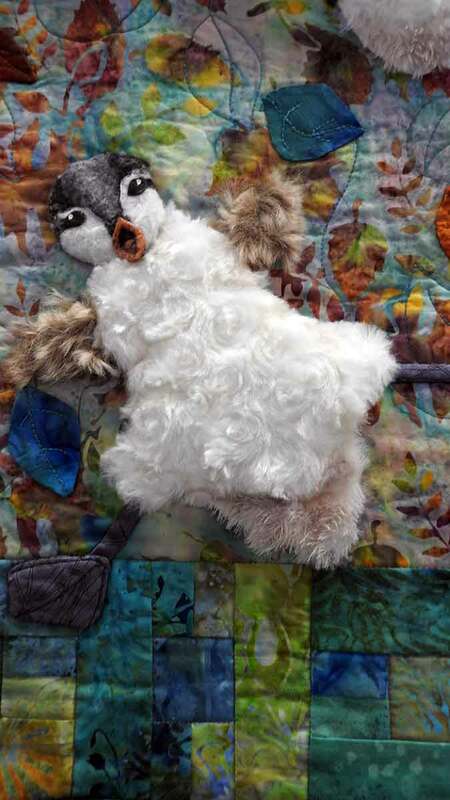 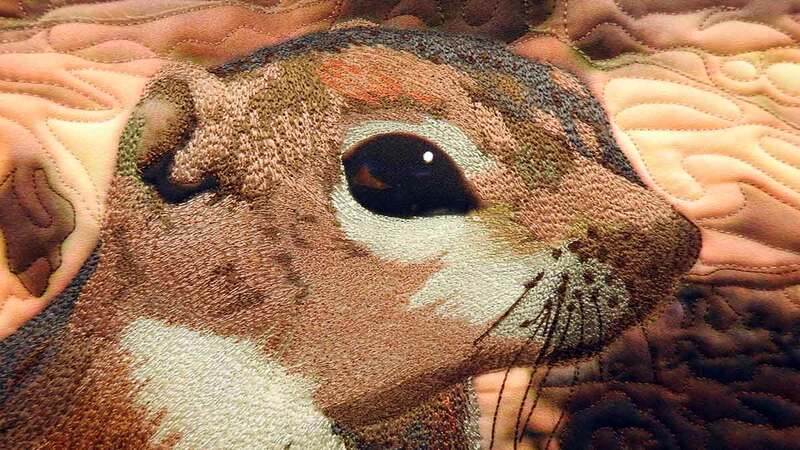 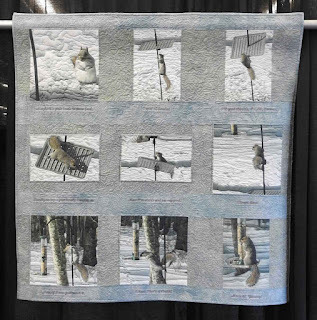 The squirrel was still there when my husband returned, and I photographed him doign push-ups on a r rock and then printed the image to polyester fabric using disperse dye, thread painted using free-motion, and machine appliqued with trapunto and machine quilted." 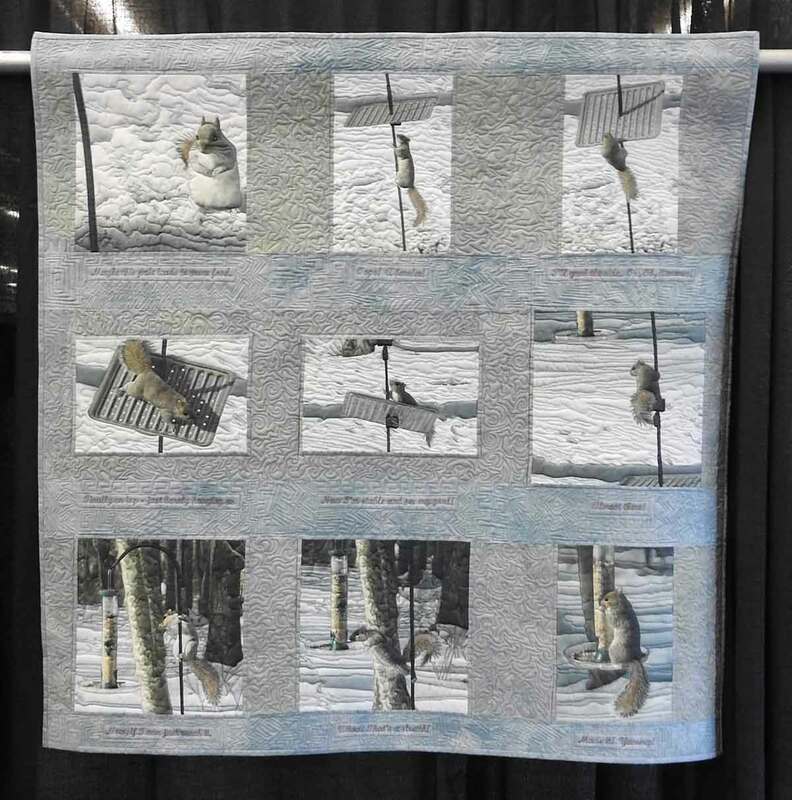 Barbara Barrick McKie, "Feeder Defeater"
"My husband put up a barrier to keep squirrels away from our bird feeder. 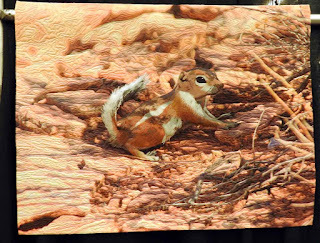 One morning I saw a squirrel attempt to get around the barrier as I captured the attempt in photographs. While the squirrel had difficulty, it did solve the puzzle. 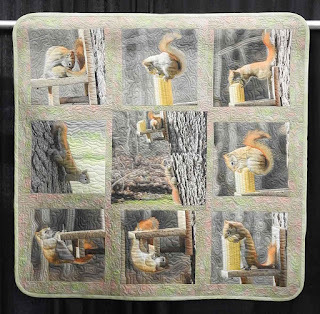 Under each photo is my interpretation of what the squirrel might have been thinking. 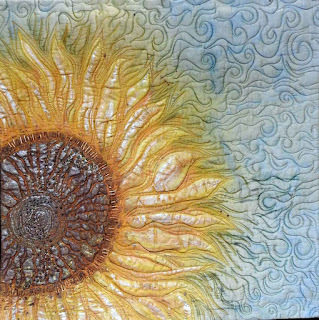 Polyester print, hand dyed cotton. 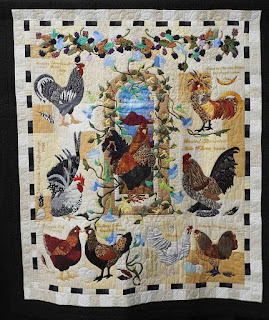 Machine pieced and quilted." 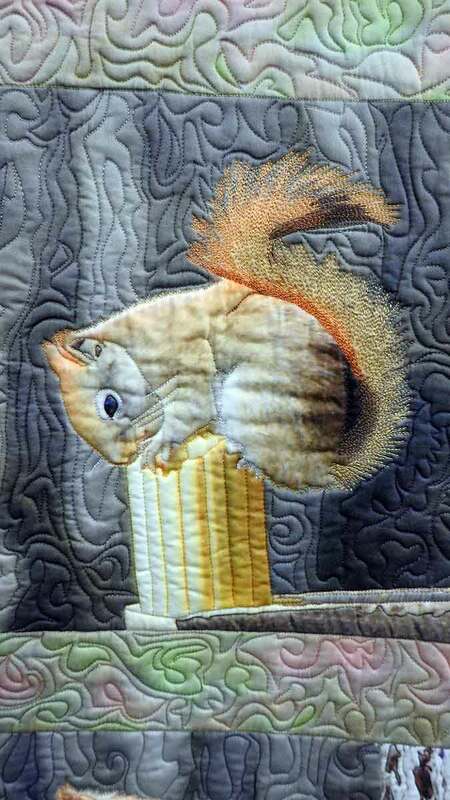 Barbara Barrick McKie, "Backyard Entertainers"
"For the first time, red squirrels came to our backyard. 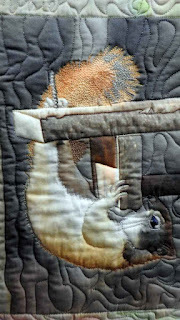 They were very funny in the way they interacted with each other and the corn feeder that attracted them. 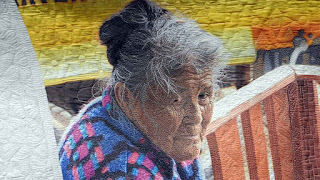 Each day they took me out of ordinary life's functions, and kept me in a smiling mood every day I worked on the quilt. Digitally manipulated and printed to cotton, machine pieced and quilted on home machine." 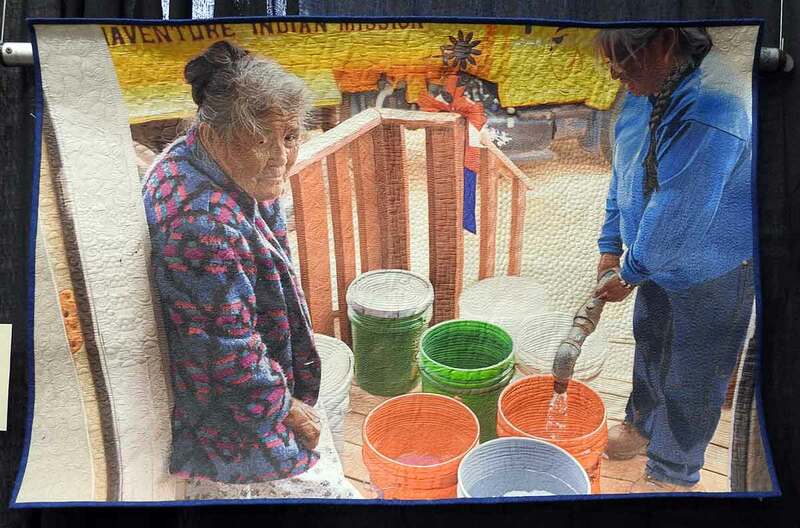 This quilt below is very powerful and incredible. Read more about "Water Lady". 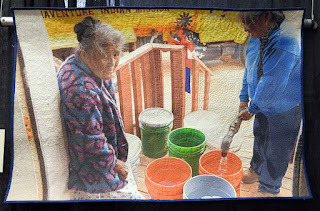 Jennifer Day, Sante Fe, New Mexico, "Water Lady". Phyllis Binkley, "A John Muir Moment at 9300 feet"
Detail of "A John Muir Moment at 9300 feet"
I love this one below. 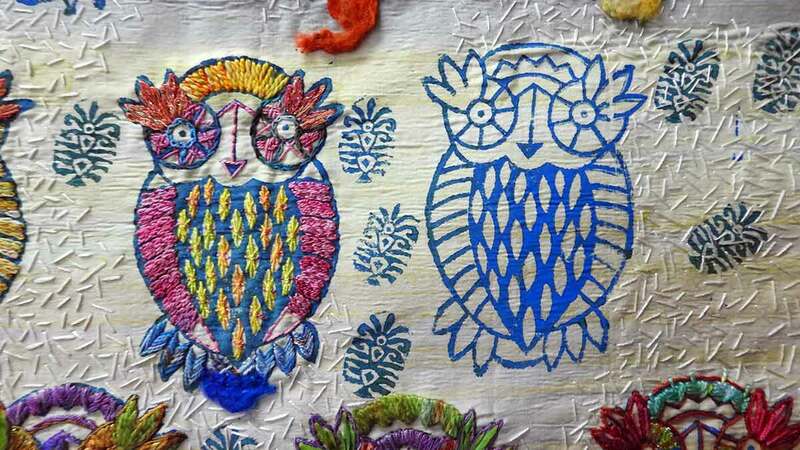 I like how she combines prints with hand embroidery. 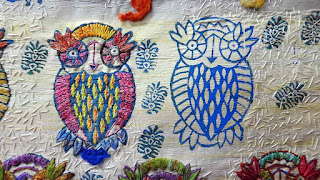 It's very whimsical and I love owls. 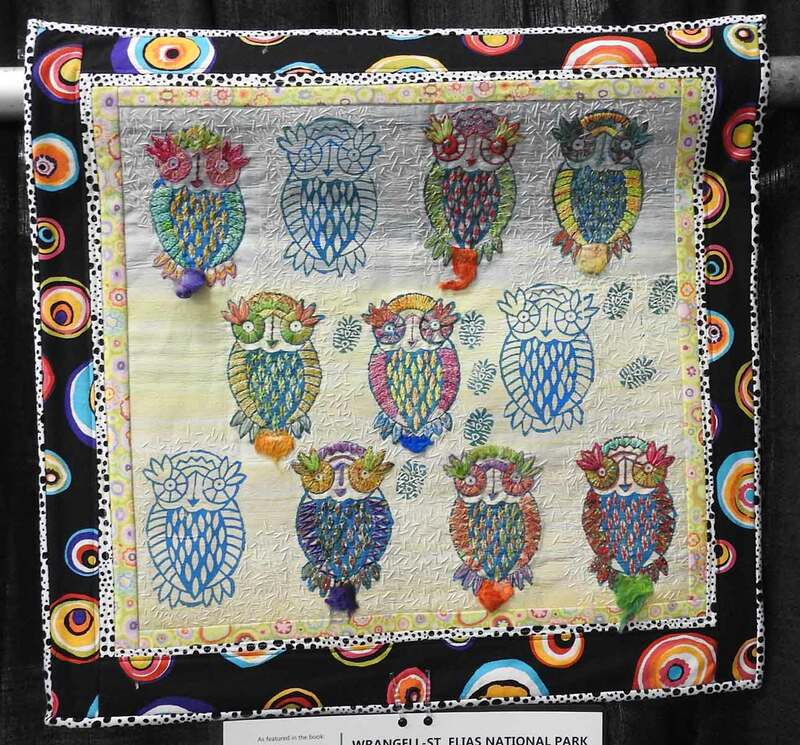 Judy Gula, Annandale, VA, "Boreal Owl"
Deborah A. Dempsey, Oak Hill, VA, "Eveningstar"
Ann Douglas, Springfield, VA, "Fireweed"
This one caught my attention because it is a quarter square triangle quilt. 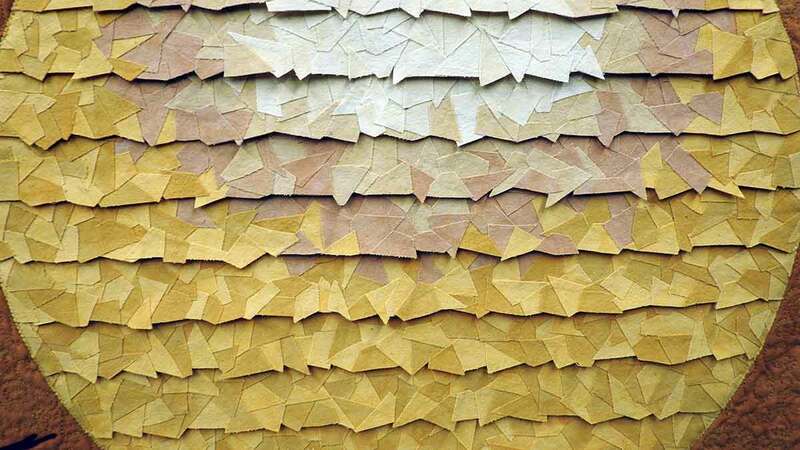 Similar to my quilts. 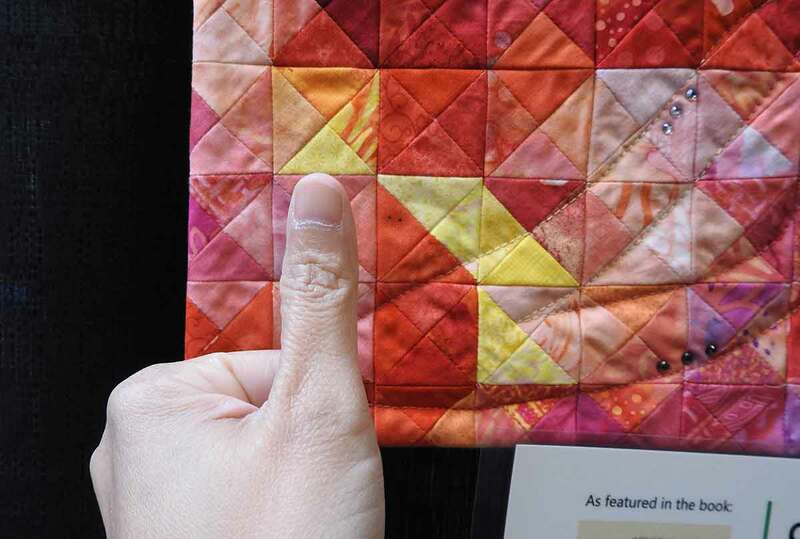 But what is interesting is how small hers is. 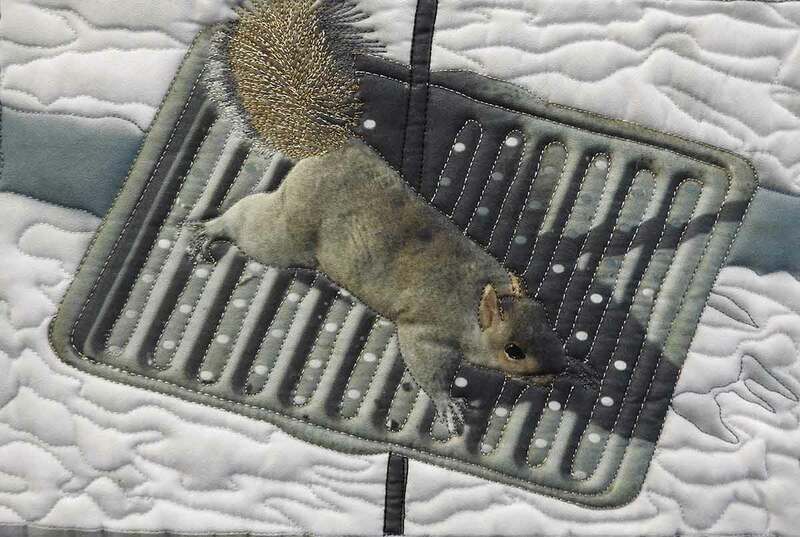 My are 1 3/4" finished. 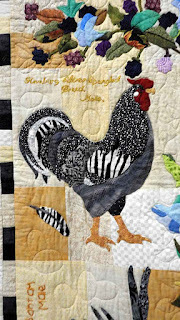 I think this one is approximately 1 1/2" finished. 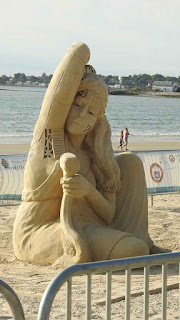 Wow weeee! 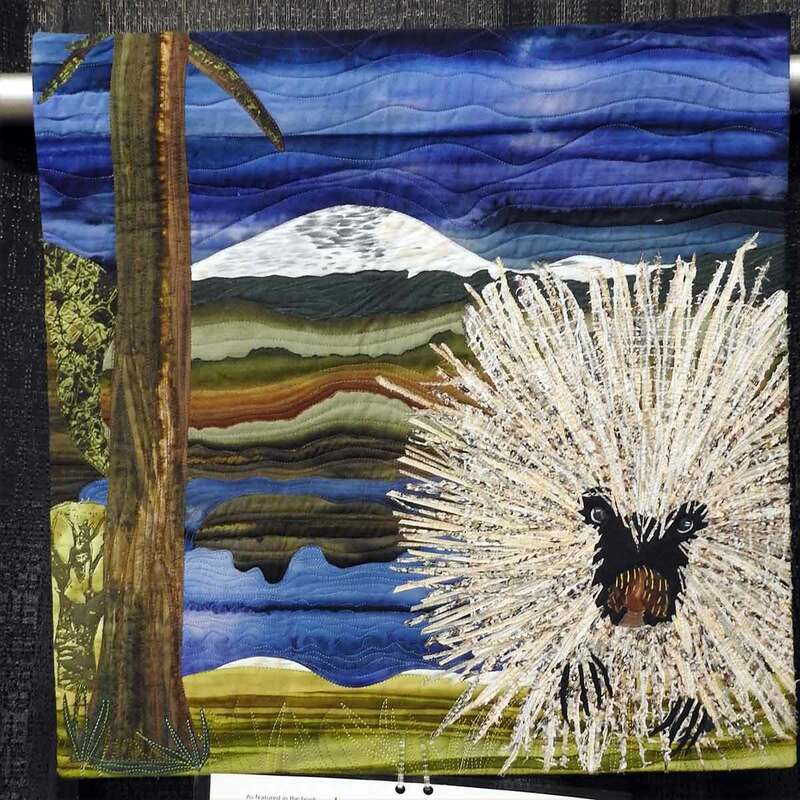 Tammy Howell, Salem, OR, "Western Columbine"
Laura Espenscheid, Austin, TX, "Fungus"
This one below I love. 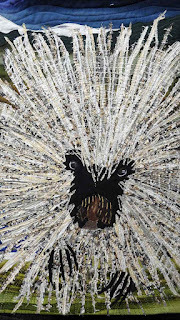 I love her technique of making the porcupine. 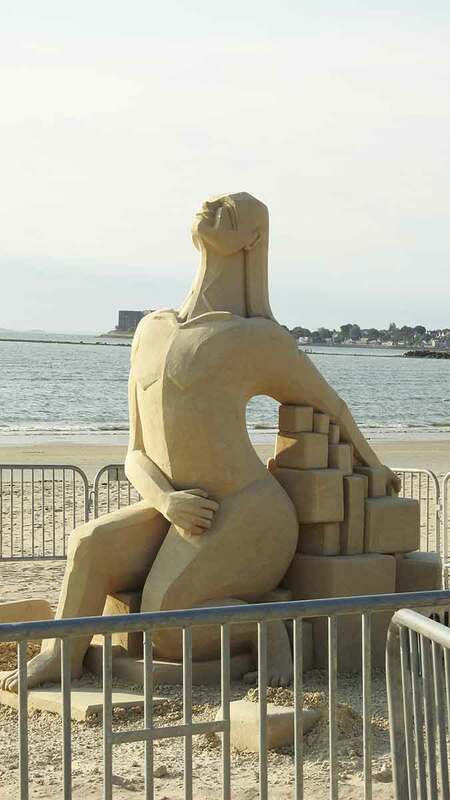 I wonder what this technique is. Sandy Kretzer, Burke, VA, "Porcupine"
Joyce L. Carrier, Purcelville, VA, "Singing Vole"
This one below is a real cutie. Lisa Arthaud, Warrenton, VA, "Wood Duck"
Bobbie Dewees, Springfield VA, "Roadrunner"
Besides owls, I like frogs too. 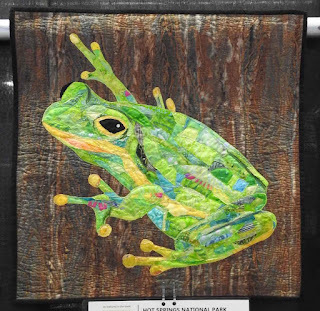 Susan M. Bynum, Falls Church, VA, "Green Treefrog"
Well, that's Part I, stay tuned for Part II of this quilt show.